Here at Inter-Tech Collision Center, we know when your car is involved in an accident; the objective is to have it repaired to as-good-as-new condition. One of the most challenging stages of auto body and collision work is final finishing and paint matching. Don’t trust this crucial step in the repair process to any body shop. Inter-Tech Collision knows that good repair not only makes you feel better about your car, but also has financial implications if you decide to sell or trade. Leased vehicles have the same issue at turn in time, because excessive damage may be charged back to you if the dealer has to correct mistakes made by the body shop. We have all seen bodywork that is not up to par, performed by some less reputable body shops, and it often looks worse than the original accident when not done properly. If the entire panels have been replaced, there is often a noticeable difference between the new panel and the rest of the car because of mismatched paint used in the color matching process. 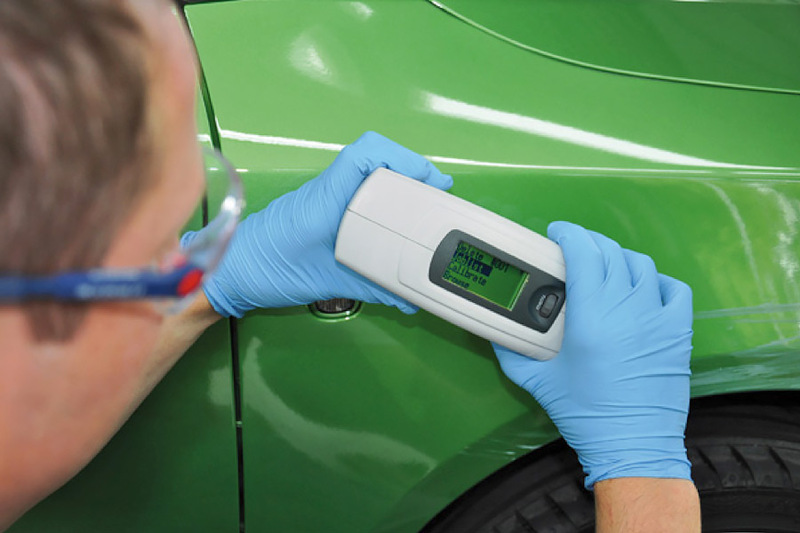 It is the job of the body shop to make sure your car looks as good as new, and this is a challenge as paint and color matching is one of the most difficult skills to master for any technician. When your car was originally painted at the factory, the entire body is painted at the same time from the same batch of paint. This is done to ensure all parts of the car are the same color and shade of paint. Body paint matching is an art, and only an experienced auto body shop, like Inter-Tech, can accurately match new paint to an original finish. Additionally, color variations from original are inevitable because of normal aging. When a car has been on the road for a few years, there is a normal fading of the color. Even if a new batch of paint is mixed to factory specifications, there may still be a noticeable difference, and this is where the skill of the body shop comes in. The older the car, the more difficult it may be to match the paint. At this point insurance coverage has some influence on the repair work. If a door panel on an older car needs to be repaired a good body shop should be able to match the paint to your satisfaction. There are blending techniques that allow new paint to lightly overspray old paint to achieve a transition that is not noticeable. In some cases, it may not be possible to match the paint due to weathering and fading, and it may be necessary to paint the entire side of the car. Some insurance companies may refuse to pay for this additional work, and you may have to make your case with the adjuster or ask the repair shop to include this extra step in the interest of doing a quality repair. Any accident is an unpleasant experience that you want to put behind you. Here at Inter-Tech, we want to make the best of a bad situation. Getting your baby repaired properly, and getting you back on the road again safely, is the best way to put this dramatic situation behind you. We’re here to assist you through this entire process, so If you need some help with your insurance provider or have any questions or concerns about getting the right color, and what process will be used, call Inter-Tech Collision Center today at (402) 898-8900. So call your nearest Inter-Tech Collision Center today and let us get you back on the road.